We have to admit that we all are obsessed with skateboarding. How cool those skateboards make you look right. Hence, skateboards are always in demand, and they are getting more and more advanced. The skateboards trending these days are the electric skateboards that have caught everyone’s attention. They are not only stylish, sleek, smart and cool but also technologically advanced and have all the features that we always wanted to have in our conventional skateboards. The electric skateboards are really great means of transportation or enjoyment whatever you want. 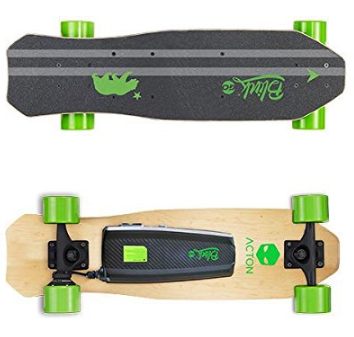 These are way faster than the ordinary skateboards, more convenient to use, more controlling and last but definitely not the least more in price. This is where our limitation lies. Each one of us wants to buy an electric skateboard, but the prices of these electric skateboards stand as barriers for us. So, if you are one of those people who is not buying the amazing electric skateboards because of their high prices, then you need not give up on your wish of buying one. 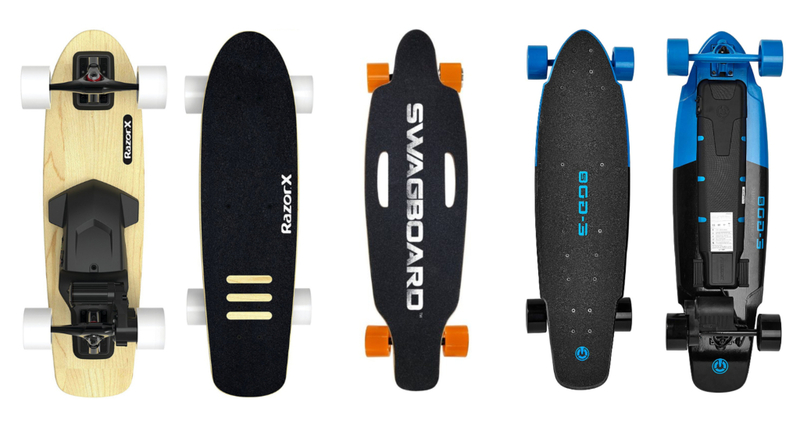 You have come to the right place because we will tell you about all the electric skateboards that are definitely not heavy on your pocket as they are just under $500. So, let’s not make you wait for more and let’s take a look at feature overview of my Top 3 Electric Skateboards Under $500. Furthermore our comparison table and buyer’s guide will help you choose the right one for you. Buyer’s Guide: What Are The Features Necessary In Your Electric Skateboard? Q: Can I ride my electric skateboard while it is raining? Q: Is water-resistant skateboard and water-proof skateboard same? Q: Can we replace bearings and trucks? Q: Are batteries of electric skateboards replaceable? 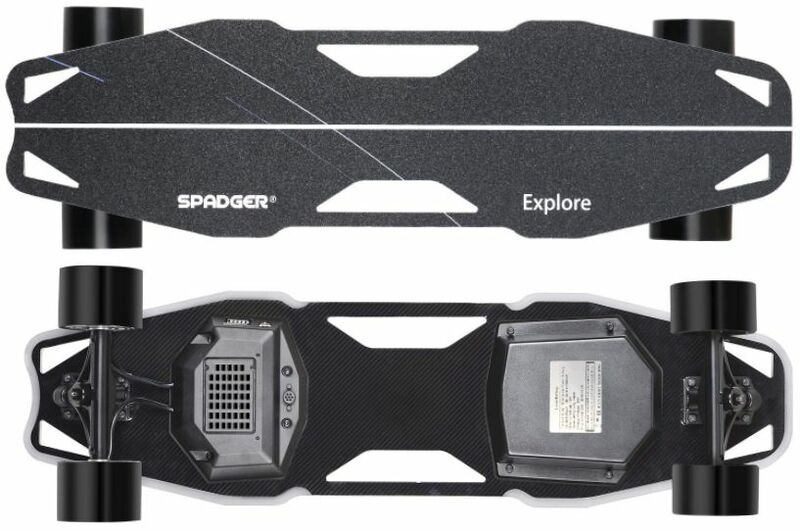 The Spadger electric skateboard is all one can wish for and you will know why. It has literally got everything from speed to range, from cool looks to LED lights, from portability to high performance even on terrains; you name it. This is personally my favorite when it comes to its looks and performance. It gives a top speed of 23 mph which is really fast and you can ride it for 12 miles with a single charge. The battery used in this one is a 36V 4.0Ah lithium-ion battery that charges in just about 2 to 3 hours. When it comes to its power, this is where it shines two motors of 450 W each that give this board a total power of 900 W. This motor is what makes its performance exceptional and enables this board to take you over gravel driveways, potholes, muddy grass patches, cracked pavements and inclines. The deck is very unique and not the traditional wooden deck. It is a combination of polycarbonate, sea glass and lead which makes the Spadger stand out. This material not only makes the board not only flexible but also fire-proof, explosion-proof and shock-proof. And coming to the looks, one word for that SUPER COOL. It’s shape and metallic look is very unique and it also has LED lights which make it look even more sleek and stylish. So, you won’t get such a great value for money with any other one than the Spadger electric skateboard D5X Plus. You can also select different modes to adjust speed to your preference and Bluetooth connectivity is also available. Well, I actually couldn’t find any con in this one. Even after trying quite hard I couldn’t complain because the performance is much more than the price. All in all, I’ll recommend the Spadger electric skateboard to anyone any day. The battery takes only two hours to charge and provides a range of 11 miles with a single charging. The 90 mm wheels with 82 A hardness are extremely shock absorbing so that you can enjoy a smooth cruising even on uneven paths. 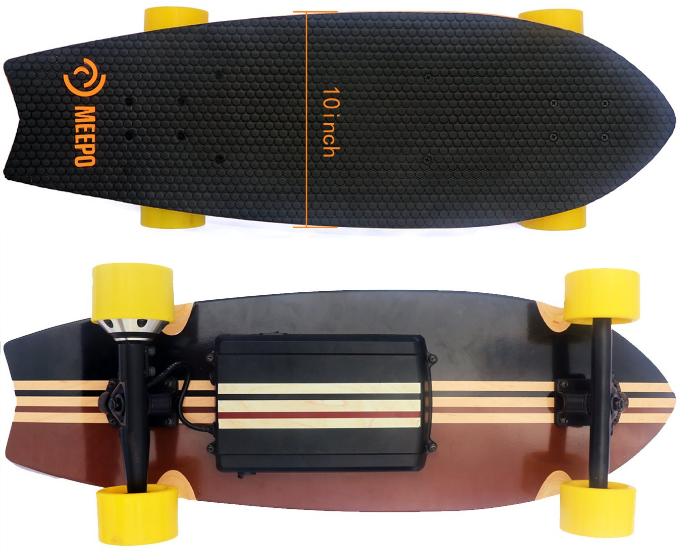 The 38-inch Meepo electric skateboard that weighs only 16 lbs can carry weight up to 250 lbs.The deck and entire shape of this one is very stylish. So, if you are looking for a high speed electric skateboard that will make heads turn with its looks then look no further. 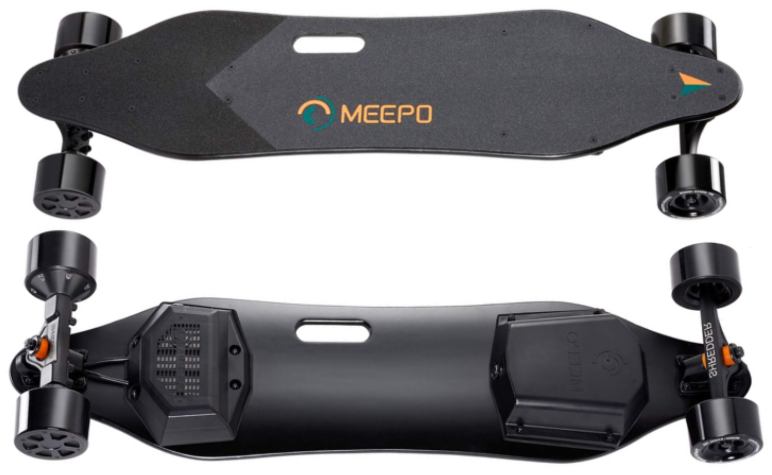 Another thing that makes the Meepo stand out is its braking system. 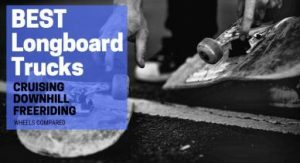 The braking takes place very smoothly so that you don’t fall off your board due to sudden braking. As for the cons section, I think it should have a side cut out handle like other skateboards have because that makes carrying it around very convenient. Nevertheless, overall it is worth every penny so do try it once. The Teamgee H5 electric skateboard is the thinnest electric skateboard in the skateboarding world. It has a thickness of only half an inch… Can’t believe it Right! But that does not mean that it is not durable, it has been designed in a specific way so that its thin and light yet sturdy. This one gives a top speed of 22 mph and a range of 11 miles which is pretty good. The board is powered by two motors of 380 W each giving it a total power of 760 W. This powerful motor will take you up inclines up to 25 degrees so you can take it to moderate up hills easily and it is powerful enough to take you on rough or cracked surfaces too. The battery will need only 2 hours to charge fully so you can ride your skateboard without much waiting. The Teamgee H5 electric skateboard looks very stylish and sleek with its slim and smart build-up. The top of the deck has a very simple but cool look which you are sure to like. Even with the thin deck, this skateboard can withstand a load of 200 lbs. the acceleration and braking system of this board is also very good. While riding the Teamgee H5 skateboard, I couldn’t find a deactivation mode on the remote so that was my only concern. Other than that, everything was fine. 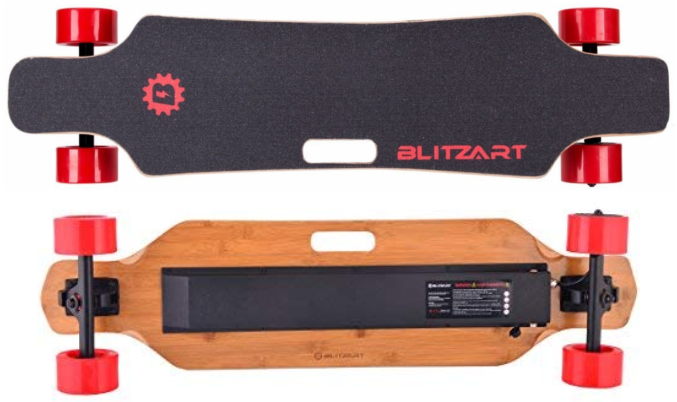 Like the other Blitzart skateboards the Blitzart Huracane also has great features. Just like the Blitzart tornado, the Huracane is also powered by a 350 W hub motor that most of the well-known skateboards have. This motor provides this board with enough power to run at a top speed of even more than 17 miles per hour. The Lithium-ion battery gets charged in about two and a half and can provide a range of 10 miles per charge. The maximum weight carrying capacity of the Blitzart tornado which weighs about 13 lbs is 250 lbs. These factors are very much dependent on the weight of the person riding the board and the path that one is riding over, but still, Huracane performs much better than Tornado. So you see that most of the features are same, but the Blitzart Huracane is much better in performance. The deck of the board is a combination of Canadian maple wood and bamboo. This 38-inch long skateboard has a 7-ply maple wood with two layers of bamboo on the bottom and additional grip tape on top. 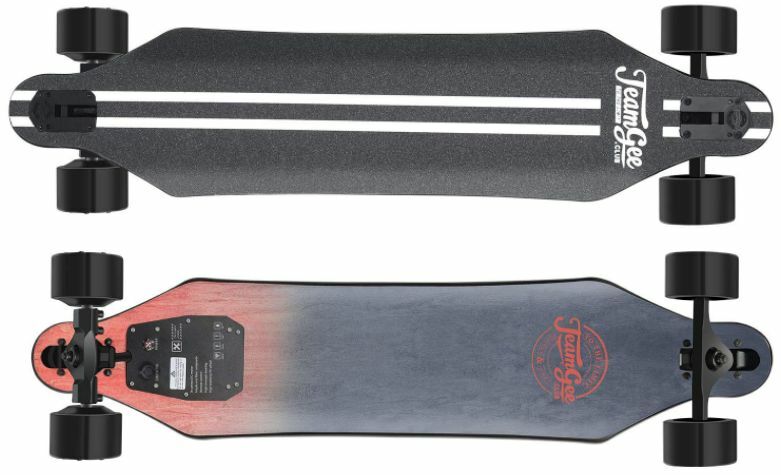 The grip tape ensures that the rider’s feet stay firmly on the skateboard. The deck is made in such a way that it makes the board strong as well as flexible to maintain balance. As far as its function a battery protection technology termed as Sentry Shield is used a battery protection technology termed as Sentry Shield is used a battery protection technology termed as Sentry Shield is used in is concerned, it runs quite smoothly and provides a quiet ride due to the hub motor. Due to its lightweight, it offers excellent control and stability. The remote controls are also impressive. Hence, it’s a pretty great skateboard at a reasonable price. Moreover, the wheels are 90mm in diameter which makes them extremely shock absorbing and you can enjoy a very smooth and comfortable ride. These wheels can help you climb up an incline up to 10 degrees maximum. The wireless remote of this skateboard allows you to control acceleration as well as the deceleration of the board. Regenerative braking is also available on this board. These specs make this skateboard exceptionally easy to control. It is overall a great skateboard, but it is not waterproof. But considering its excellent performance and functioning what harm does it do to neglect a small shortcoming. The Acton Blink Lite is your ideal electric skateboard. The most special thing is that it is the world’s lightest electric skateboard with a weight of only 7.7 lbs. This makes it a perfect fit for young kids and teens, and you can take it with you wherever you go. Even with such a lightweight, this skateboard does not compromise on its features. The motor used is a 250 W hub motor which has enough power to provide you with a top speed of about 10 miles per hour. The lithium-ion battery takes less than two hours to charge and provides you with a range of 5 miles with a single charging. The controlling is great as well as pretty simple, and the regenerative braking system of this board is exceptional. The deck is made up of Canadian maple wood and is 30 inches long. It has a capacity of carrying up to 130 lbs of weight which is pretty good for such a light skateboard. All in all, it’s a simple skateboard equipped with all the features a good skateboard has, and you will definitely enjoy riding on it. This skateboard has a Bluetooth feature incorporated into it. So, you can enable the controls with your smartphone too. What makes the Acton Blink Lite safer and cool is the safety lights. The LED safety lights make the rider visible to the traffic and pedestrians which truly helps at night. These LED lights at the rims of the board make it stand out. This little buddy might not be ideal for hilly areas. It is light in weight and not powerful enough to resist the rough and tough conditions in the hilly areas. But it is just perfect to ride around the town or to your favourite store. 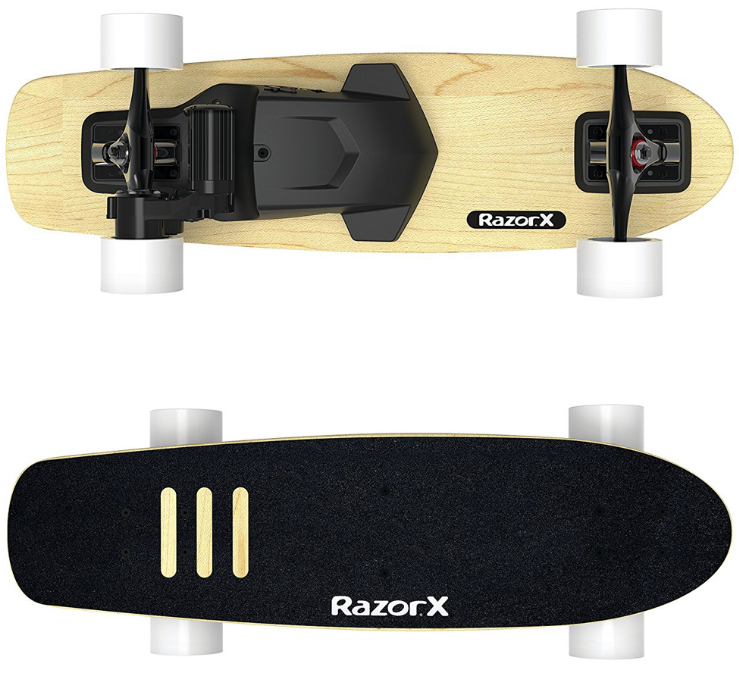 If you are totally new to skateboarding and you don’t want to spend much yet have a great experience, then the Razor X electric skateboard is the one you need to have. 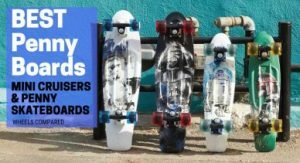 It is not only one of the least expensive skateboards but also very easy and convenient to be used by first-timers. Even with all its simplicity, it delivers similar features as an expensive skateboard does. This skateboard is powered by a 125 W motor which provides enough power to run the skateboard at a top speed of more than 10 miles per hour. The battery is a lithium-ion battery like the other skateboards have, and it gets charged in about 2 hours. You can enjoy running the skateboard at its top speed for 40 minutes continuously with a single charging. This is pretty amazing for a skateboard with such a low price. A 5-ply maple wood deck can support a rider with the maximum weight of 220 lbs. The deck is almost 30 inches long and is designed in a very sleek and smart style. The wheels and gripe tape add to the perfect stability and balance of the Razor X electric skateboard. In addition to this, the rear wheels are mounted to the board in such a way that you will not experience any alignment issues. So, its almost maintenance free which adds to all the other remarkable features of this skateboard. Its distinguishing feature is its wireless remote with a wrist strap which makes it very easy to control. You can change your speed and take electrifying curves and turns conveniently by reaching your wrist. It can run continuously for only 40 minutes, but to the bright side, this little package has all the essential features and that too at the least price. Moreover, you don’t have enough colour choices for this skateboard. The Blitzart skateboards are known for their great features and durability. The Blitzart tornado is a pretty good skateboard powered by a 350 W hub motor that most of the well-known skateboards have. This motor provides the board with enough power to run at a top speed of 17 miles per hour. The battery which is used in it is a Lithium-ion battery that requires about two and a half hours to charge fully. The board can run for about 10 miles with a single charging which is pretty decent. Here it must be mentioned that these factors are very much dependent on the weight of the person riding the board and the path that one is riding over. The deck of the board is a combination of Canadian maple wood and bamboo. This 38-inch long skateboard has a 7-ply maple wood with two layers of bamboo on the bottom and additional grip tape on top. The gripe tape provides the necessary traction to the rider. The deck is made in such a way that it makes this board very durable. You can choose from a wide variety of colours so you can get this board in the colour of your liking. The maximum weight carrying capacity of the Blitzart tornado is 250 lbs. As far as its functioning is concerned, it runs quite smoothly and provides a quiet ride. Due to its lightweight, it provides great control and stability. The remote controls are also impressive. Hence, it’s a pretty great skateboard at a reasonable price. The deck is smoother and has a rounded style which makes it different from the other boards. The wheels are shock absorbing and are made of a material that further increases the durability of the board. The battery indicators don’t clearly indicate the battery level when it is getting low. Moreover, some people might find it a bit heavy, but its build-up makes it extra durable so some extra weight won’t hurt. Now this skateboard can be compared with an electric scooter in its functioning. Pretty amazing right!!! Well, we all are aware of how fantastic the Yuneec skateboards are, and this particular skateboard is no exception. It is a modified model of the Yuneec E-GO and definitely better than this one. The stylish deck of this skateboard is made up of layers of thick composite wood with a gripe tape that strongly grips the rider’s feet to the board. The deck material makes this skateboard very durable. This board has a very powerful motor that provides 400 W power and a top speed of 14 miles per hour. The Lithium-ion battery requires about 4 hours to charge fully, and it delivers a range of 18 miles with a single charging. These specs are really great for a skateboard with such a decent price. The skateboard weighs about 22 lbs, and it can carry up to 220 lbs of weight which clearly depicts how much strong this board is. Yuneec E-GO2’s deck style and its wheels make it very suitable to ride in hilly areas and on rough or uneven surfaces. Moreover, it is perfect for the people who would like to show off their skills with their skateboard by performing interesting tricks and flips. It’s controlling, and regenerative braking system is designed specially to ride on busy roads where you will have to use your brakes all of a sudden and more frequently. The unique feature of this skateboard that you will not find in any other is that it vibrates when the battery level is decreasing. This frees you from keeping an eye on your clock because just when it vibrates, you will know that its time to head home and get your board charged. This vibrating feature literally gives you the feeling you get while holding video games controllers. The special thing about the Yuneec E-GO2 is its strong tires that are 90mm thick in diameter, so it has a very good shock absorbing capacity. Hence, you don’t have to worry about your board getting damaged due to cracked or uneven roads. You will enjoy a very smooth ride on this one thanks to its strong buildup and wheels. In addition to this, this board has been made absolutely waterproof. Hence, you won’t find a more reliable and durable electric skateboard than this one. It is available in colours like neon green and candy pink which some people might not prefer, and they won’t even consider giving it a fair look. Nevertheless, the blue colour looks very cool and is very much in demand so you can find it difficult to get it in blue colour. The phoenix Ryder is an advanced kind of electric skateboard, and it is the only dual motor skateboard in our list. Each of the hub motors has 350 W power which means it provides the power of a total of 700 W which is immense. This is why this board can take you on slopes up to an inclined angle of 15 degrees. What else would you want really? These motors provide the top speed of 12 miles per hour. Moreover, the Lithium-ion batteries allow you to travel for 12 miles continuously with a single charging. The battery requires only two hours to charge fully. As to the structure of the deck, it is about 32 inches long and has a unique style which makes it stand out. Its deck design makes it very much suitable for skilled skateboard riders who want to do some flips and turns, but even the newbies can ride it with ease. The deck has a total of seven layers with six being made of Canadian maple wood and one of bamboo. These layers make this board strong and sturdy as well as add the required flexibility to it. Even with a light weight of only 10 lbs this skateboard has the maximum weight carrying capacity of 220 lbs which is very good. The best thing is that even with the maximum weight, the performance of the board remains exactly the same. 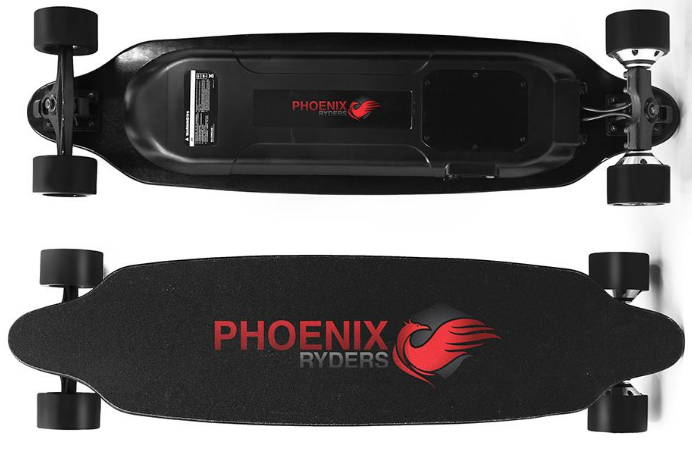 The other skateboards tend to become very slow at their maximum weight bearing capacity, thanks to Phoenix Ryder’s dual motors it does not get affected by such factors. 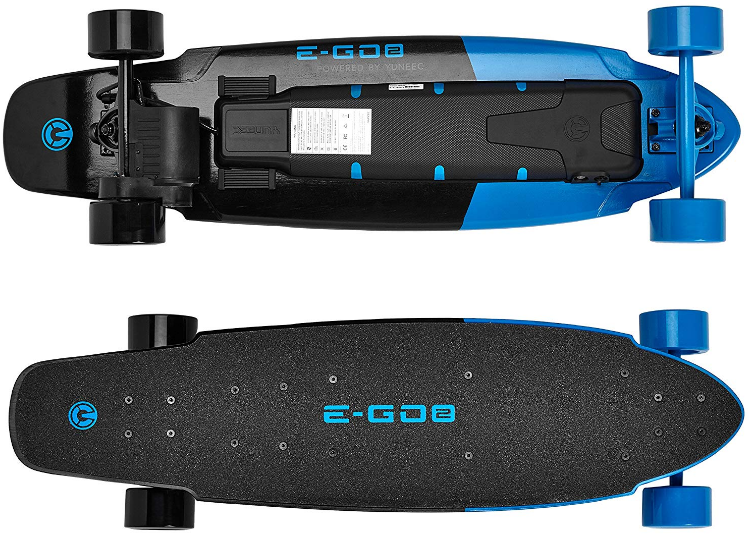 As this skateboard has double the power than the ordinary electric skateboards so one would expect it to have double the speed and double the range but it really disappoints in these aspects. But the dual motor power does well in getting you up slopes and inclined places. 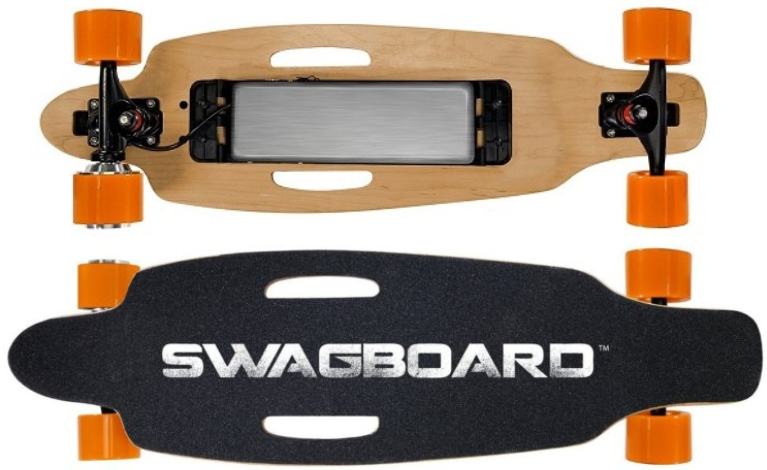 As the name indicates, the Swagtron Swagboard is sure to add to your swag. Swagtron never fails in manufacturing great skateboards and that too in the lowest possible price. The Swagboard NG-1 electric skateboard has a 350 W motor that produces a power of 11 miles per hour. The battery gets charged in about 4 hours, and you are good to go cruising on your board for 10 miles with a single charging. The deck ensures durability as it is made up of 7 layers of good quality maple wood and premium grip tape. The build-up of the deck makes it not only sturdy but also flexible enough to give the rider superb control. This maple wood deck can support a rider with a maximum weight of 176 lbs which is a decent one whereas the board itself weighs only 10 lbs. This lightweight skateboard helps maintain stability and its powerful shock absorbing wheels let you cruise around smoothly and conveniently. It is also equipped with a regenerative braking system. Hence, overall with a small amendment, this particular skateboard is a perfect package for you. The board is controlled by a wireless LED remote which enables you to control all the functions just by the click of your hand. Moreover, it also displays the speed and battery level so you can keep track of everything and still enjoy cruising around the town. Practically, this skateboard does not fulfill the stats stated above. Instead of 10 miles, you will get to enjoy riding on your Swagboard for about 5 to 6 miles with a single charging. But, if the battery issue gets fixed, then it is definitely your classic electric skateboard in more than a reasonable price. You obviously want a skateboard at a reasonable price, but you cannot just look for a low price and overlook all the other features. Below we have listed all the features you should closely observe in your skateboard. Your skateboard should have a good battery life so that you can enjoy riding on it without having to worry about charging your board’s battery. Hence, you definitely need a skateboard that has a good range with a single charging. The deck material matters a lot because the deck material will not only ensure the durability of your skateboard but also the ease with which you can skate. The deck material needs to be of such a type that your feet have a good platform to grip to. If your feet are well gripped to the deck, then you can ride safely as well as with ease and comfort. There are many different materials used for the deck like maple wood, bamboo, wood with carbon fibre or aluminium. In addition to this, the size of the deck also matters. Sometimes you have to ride on roads that are not smooth or uneven, so you feel lots of jerks. For such paths, your board must have shock absorbing wheels that work efficiently. The shock absorbing wheels will not let you fall off your board on a bumpy road and will also keep your board safe. So, with good wheels, you will be able to enjoy a smooth ride. You obviously want to enjoy riding on your electric skateboard and what fun is skateboarding without good speed. Therefore, the maximum speed range of your skateboard must be high. Moreover, the weight-bearing capacity of your skateboard and its maximum battery power should also be great. 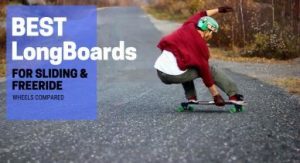 Now, let’s get to what you all have been waiting for, and yes that’s the list of the ten best skateboards under $500 that we have picked especially for you. A: Most of the electric skateboards are not water-proof. So, as they are electric, it will not be suitable to take them out in the rain. But, if your seller confirms that the skateboard is waterproof like the Marui electric skateboard, then you can ride it in the rain too. Nevertheless, I always confirm from your seller or see the instructions. A: No, the water-proof skateboard can withstand rain and water-filled potholes but water-resistant skateboard can’t. Water-proof skateboards will not be affected by water at all but water-resistant will withstand only a little contact with water and not more than that. In short, if your skateboard is water-proof, then you can take it out in the rain, but if it is water-resistance, then you can’t take it out in the rain. A: Mostly you can replace bearings and trucks with better ones or more durable ones. But, it also depends on if they will fit right with the deck so be careful of that. You should take expert opinion so that the performance of the board is not affected by an upgrade. A: Yes, batteries are replaceable. But, you will have to get a new one from the same company. You can also ask the company or seller if you can use some other company’s battery. 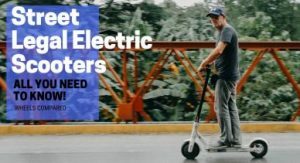 All the electric skateboards you’ll find in this list are great in one or the other aspect so after reading about each one you’ll definitely know which one is for you. The buyer’s guide will further help you in coming to the final decision. So, make your money count and have all the fun with skateboarding. Because at the end of the day it comes down to having ultimate fun… Right! 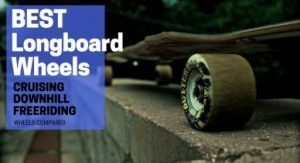 In the end, I would like to hear about your experience with electric skateboards so do write in the comments section below and let me know if this article was helpful. If you have any6 further queries, concerns or suggestions hit me up in the comments and also let me know which skateboard you found suitable for you.